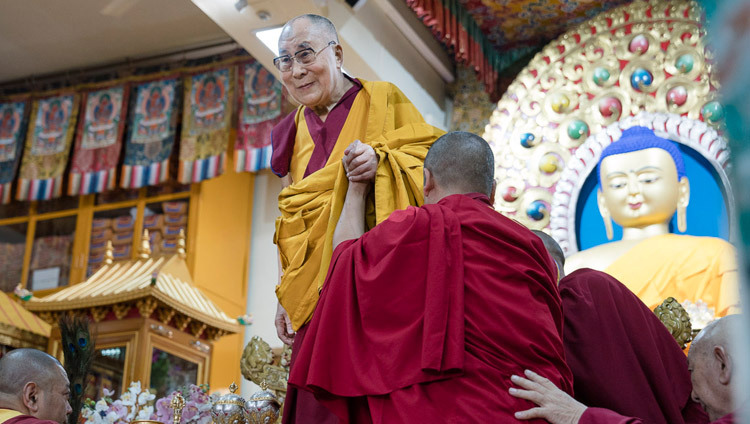 Thekchen Chöling, Dharamsala, HP, India – The Tsuglagkhang, its surrounding areas and the yard below were filled with smiling faces, Tibetans’ and foreigners’, happy to see His Holiness the Dalai Lama. 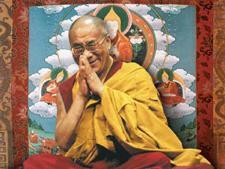 He took his seat on the throne and began the preparations he needed to complete to give an Avalokiteshvara empowerment. “Today is a special occasion,” he said, addressing the crowd, “linked to the collection of six-syllable mantras that we generally perform every year in this month that commemorates the Buddha’s enlightenment. We do this recitation for the benefit of all sentient beings, but especially those human beings on this earth disturbed by attachment and anger. As Shantideva says, we don’t want suffering, but we run after its causes—the disturbing emotions within us. The Buddha said, “Don’t commit unwholesome deeds, do virtue”. In general actions that result in happiness count as virtue. Those that result in the suffering of others are unwholesome. “If we really wish all sentient beings to be free from suffering, we need to explain to them that an unruly mind is a source of unhappiness while a disciplined mind makes us happy. Peace in the world depends on our relating to each other with compassion. The various philosophical views of different religions all constitute different approaches to supporting compassion. His Holiness went on to explain how the Buddha completed the path. At dusk, seated under the Bodhi tree he overcame Mara. He was totally absorbed in the middle of the night and attained enlightenment at dawn. Having done so he thought, “I have attained this nectar-like Dharma, this profound, peaceful, unelaborated, uncompounded clear light, but if I were to teach about it, there is no one who would understand.” However, 49 days later he gave his first teaching in Sarnath, explaining the Four Noble Truths, the truths of suffering, its origin, its cessation and the path to it. This would be the very foundation of his teachings. Just as illness must be diagnosed, a remedy adopted and nurses’ support sought, the Buddha advised that suffering must be known, its origin overcome, cessation must be achieved and the path cultivated. His Holiness commented that once you know what cessation is you can understand suffering and overcome its cause, the three poisons of attachment, anger and ignorance. The principal of these is ignorance, a misconceiving of reality. And when you understand that these negative emotions can be defeated, you’ll see that cessation can be attained by following the path. His Holiness observed that within the Buddhist tradition there are different philosophical views and that, just as you have to learn it to know the alphabet, they need to be studied. The Four Noble Truths were part of what is known as the first turning of the wheel of Dharma. The second turning of the wheel at Rajgir dealt with the Perfection of Wisdom and there are brief and extensive sutras recording it ranging from the Heart Sutra in 25 lines to the Perfection of Wisdom in 8000 lines, 18000 lines and so on. The Buddha’s explanation of the basic nature of the mind as clear light was part of the third turning of the wheel. His Holiness mentioned our different levels of consciousness—ordinary sensory consciousness, the subtler consciousness of the dream state, the yet subtler state of deep sleep and the subtlest consciousness which is the clear light of death. He remarked that some people who access this subtlest mind at death enter into an absorption, despite their being clinically dead, during which their bodies remain fresh. Intrigued, there are scientists currently investigating this. His Holiness pointed out that the elucidation of the clear light nature of the mind provides the link between the Sutra and Tantra vehicles. He added that instructions for developing concentration involve focussing the mind on an object and the image of a Buddha is regarded as helpful. In Tantra the practitioner does this by visualizing him or herself arising out of emptiness as a deity. He recalled a Tibetan Lama called Nyengön Sungrab drawing a distinction between mainstream teachings or teachings concerning the general structure of the path and esoteric instructions intended for specific individuals. Sutra teachings by and large belong to the first category and teachings of tantra to the second. Within the Nyingma classification the words of the Buddha belong to the distant lineage, revealed treasure teachings are the close lineage and teachings derived from pure visions belong to the profound lineage. His Holiness declared that the empowerment he was giving came from the collection of the pure visions of the 5th Dalai Lama. Among them are pure visions occurring on a sensory level and those belonging to the mind. This practice of the Great Compassionate Lord of the World, Mahakarunika Lokeshvara, belongs to the first category. His Holiness reported that he received these teachings from Tagdag Rinpoche in the company of his two main tutors when he was a young boy. During that period he experienced several positive dreams. After receiving this empowerment he remembers a vivid dream in which the Fifth Dalai Lama emerged from a thangka on the wall and wrapped him in a very long yellow kata. Following the principal empowerment he also gave a permission for 4 armed Avalokiteshvara.